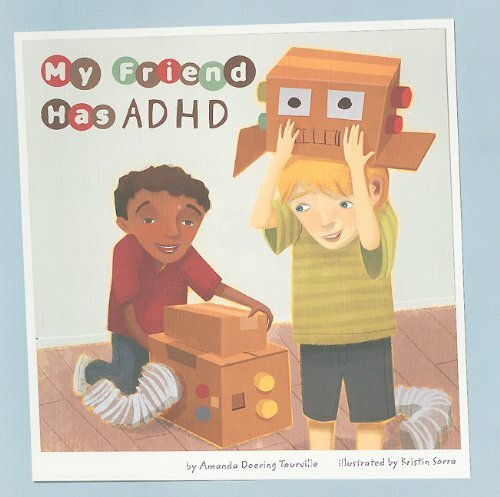 As the mom of a kid with ADHD, the first thing I did when we found out was look for ADHD books I could read with my kiddo. There are loads of way to talk to your child about ADHD, but these books helped (and continue to help) him understand his Attention Deficit Hyperactive Disorder. 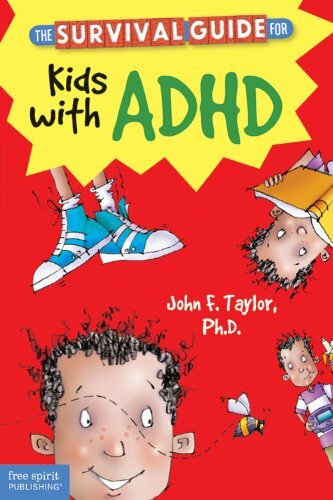 You can find these ADHD books for kids at your local library or purchase through the affiliate links provided for your convenience. To make this easier, I’m breaking down this reading list into to sections: (1) picture books for younger kids and (2) chapter books as well as self-help books for older kids from upper elementary on. My Friend Has ADHD (Friends with Disabilities): My friend Robby has a disability called ADHD. But that doesn’t matter to us. We play basketball, tell jokes, go canoeing, and help each other with our homework. I’m glad Robby is my friend! 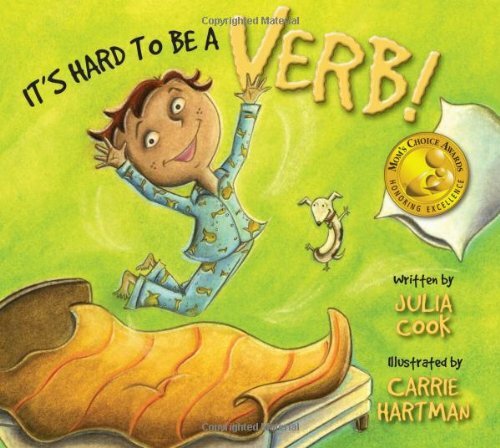 It’s Hard To Be a Verb! : Louis is a verb! He has a lot of trouble focusing and he is always doing something, but the problem is usually it s the wrong something. It s hard to be a verb! My knees start itching, my toes start twitching, my skin gets jumpy, others get grumpy. When it comes to sitting still it s just not my deal. Haven t you heard… I am a verb! Louis mom teaches him how to focus by showing him a few hands on ideas that anyone can try. A must have book for all who struggle with paying attention! 80HD: A Child’s Perspective on ADHD: 80HD summarizes the thoughts and experiences of Parker, a child with ADHD. Written from the perspective of a child, this book is a great introduction to life with ADHD, Attention Deficit Hyperactivity Disorder. Filled with colorful illustrations, your ADHD child will find commonality and entertainment from this delightful story. Join Parker in this story about life with ADHD. 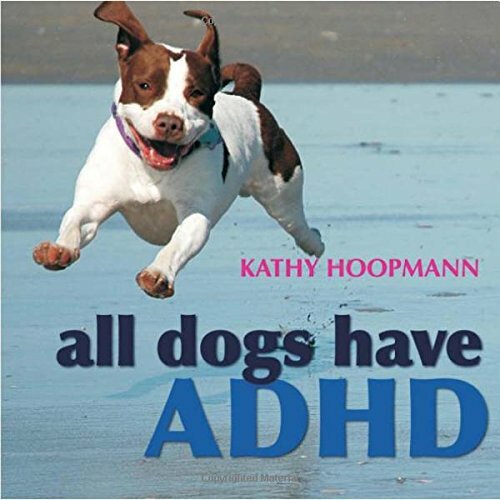 All Dogs Have ADHD: All Dogs Have ADHD takes an inspiring and affectionate look at Attention Deficit Hyperactivity Disorder (ADHD), using images and ideas from the canine world to explore a variety of traits that will be instantly recognizable to those who are familiar with ADHD. Following the style of the award-winning All Cats Have Asperger Syndrome, charming color photographs of dogs bring to life familiar ADHD characteristics such as being restless and excitable, getting easily distracted, and acting on impulse. 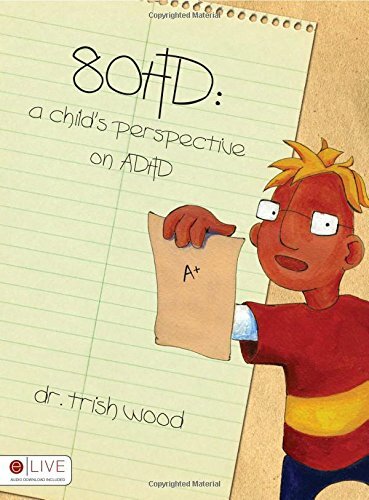 This delightful book combines humor with understanding to reflect the difficulties and joys of raising a child with ADHD and celebrates what it means to be considered `different’. This absorbing and enjoyable book takes a refreshing approach to understanding ADHD. 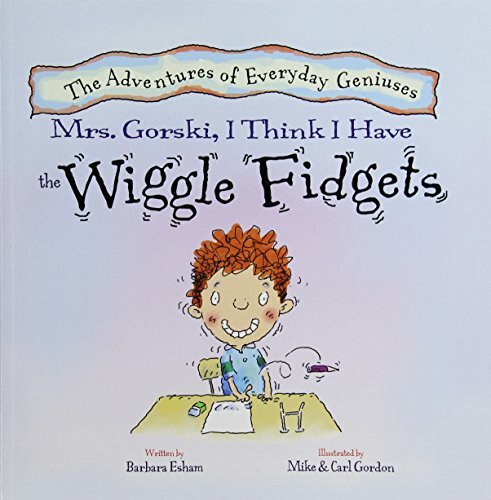 Mrs. Gorski, I Think I Have the Wiggle Fidgets: ADD / ADHD? Creative Thinking? Mover and Shaker? David doesn’t know how he ends up in such situations. At the time, it just seems like a great idea. His teacher, Mrs. Gorski, has had about enough; he can tell by the way her voice changes when she speaks to him. This time, he believes that he has come up with the best idea yet. The perfect plan to make everything better. Picture books are great but if you have an older kiddo, you’re going to want to check out these ADHD books for older children — from early elementary where they’re reading chapter books on up to teens. 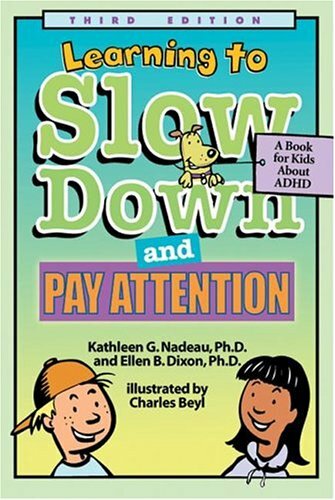 Learning To Slow Down & Pay Attention: A Book for Kids About ADHD: This third edition reflects changes in understanding of ADHD and approaches to its treatment.Parents, teachers and kids will love the checklists found in this book to help children organize their time and daily tasks. While the majority of what’s written about ADHD emphasizes behaviors that bother adults, this new edition places increased emphasis on the aspects of ADHD that are troublesome to the children. The Survival Guide for Kids with ADHD: What is ADHD? What does it mean to have ADHD? How can kids diagnosed with ADHD help themselves succeed in school, get along better at home, and form healthy, enjoyable relationships with peers? In kid-friendly language and a format that welcomes reluctant and easily distracted readers, this book helps kids know they’re not alone and offers practical strategies for taking care of oneself, modifying behavior, enjoying school, having fun, and dealing with doctors, counselors, and medication. 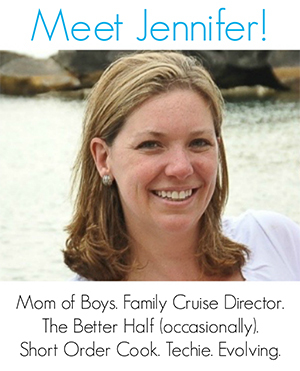 Includes real-life scenarios, quizzes, and a special message for parents. 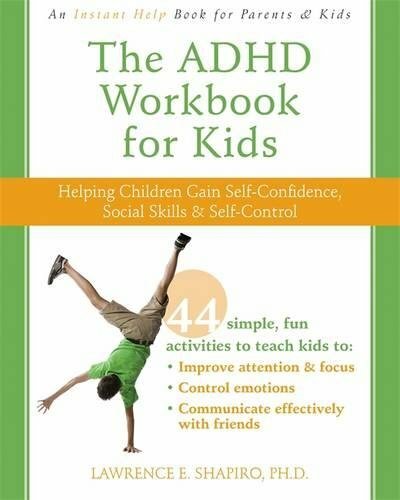 The ADHD Workbook for Kids: Helping Children Gain Self-Confidence, Social Skills, and Self-Control: All kids with attention-deficit hyperactivity disorder (ADHD) want to manage their symptoms in order to get along better with others, build confidence, and succeed in school, but most don’t have the skills they need to get their impulsive behavior under control. The ADHD Workbook for Kids offers a simple way to help children with ADHD learn these critical skills in just ten minutes a day. This workbook includes more than forty activities for kids developed by child psychologist Lawrence Shapiro that can help your child with ADHD handle everyday tasks, make friends, and build self-esteem while he or she learns to overcome the most challenging aspects of the disorder. Alone or with your help, your child can complete one ten-minute activity each day to learn how to make good decisions and discover easy techniques for staying focused when it’s time to pay attention. The Survival Guide for Kids with Behavior Challenges: How to Make Good Choices and Stay Out of Trouble: Many kids and teens have challenges when it comes to behavior. In this revised edition of his time-tested book, Thomas McIntyre provides up-to-date information, practical strategies, and sound advice to help kids learn to make smarter choices, make and keep friends, get along with teachers, take responsibility for their actions, work toward positive change, and enjoy the results of their better behavior. New to this edition are an “Are you ready to change?” quiz, updated glossary and resources, and a fresh organization and design. 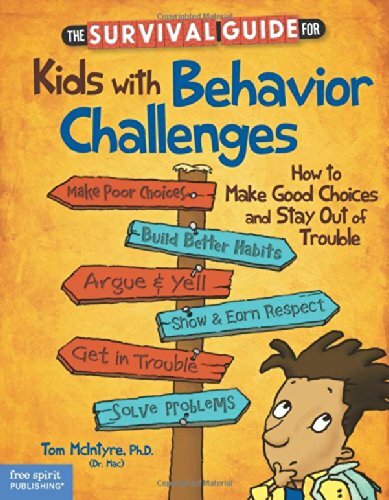 This is a book for any young person who needs help with behavior. A special section at the back addresses diagnosed behavior disorders. 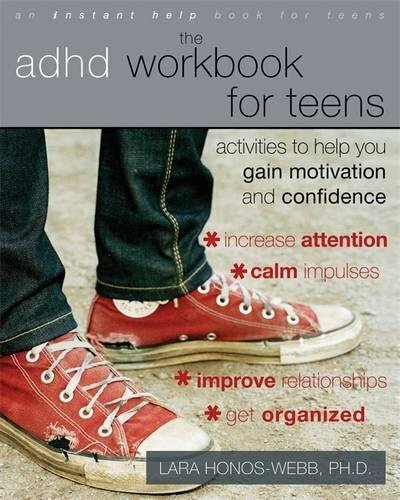 The ADHD Workbook for Teens: Activities to Help You Gain Motivation and Confidence: Symptoms of attention deficit/hyperactivity disorder, or ADHD, can strike at any time-during class, when you’re listening to a friend’s story, while doing homework, and did we mention during class? You might find it difficult to pay attention and sit still when your impulses are constantly tempting you to do the opposite. In The ADHD Workbook for Teens, you’ll learn simple skills you can use to confidently handle school, make and keep friends, and organize and finish every project you start. 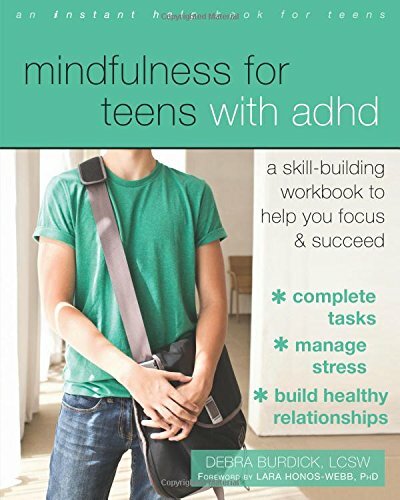 Mindfulness for Teens with ADHD: A Skill-Building Workbook to Help You Focus and Succeed: In Mindfulness for Teens with ADHD, a clinical social worker offers fast, easy mindfulness skills to help you successfully navigate all the areas of life, including making good choices, completing tasks, increasing academic success, excelling at sports, driving safely, getting enough sleep, managing stress, and more. By paying attention to the moment, you’ll find yourself less distracted and better able to focus on what’s going on right now—whether it’s an algebra test, a job interview, or an important conversation with a friend. The mindfulness activities in this workbook will also help you build self-awareness and practice self-reflection—key skills to succeeding in life! These skills will help you start feeling more focused, less stressed, and gain confidence in your ability to reach your goals. 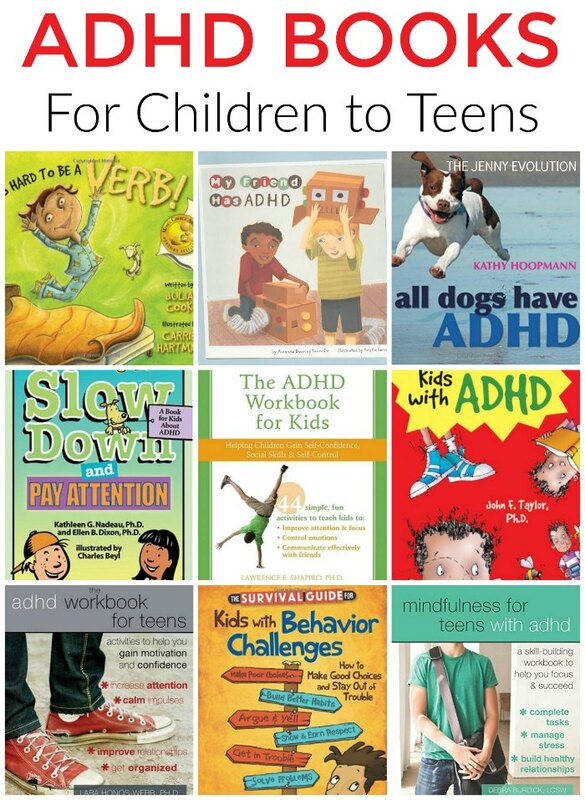 Like these ADHD books? Read more about ADHD on Mommy Evolution!